LOOKING for a special Christmas present this year?! There’s nothing quite like making magical Disney memories with your family! Be sure to see this show full of memories guaranteed to last a lifetime. First, leave a comment on this blog post telling me your favorite Disney character that will be featured in Treasure Trove (see paragraph above). What do you love most about them? That will get you one entry. For an additional entry into the drawing, become a Facebook fan of Memory Maker Mom and leave me a comment here telling me that you are a fan. That will get you a second entry! Disclosure: Disney on Ice provided the tickets for this giveaway. As a huge Disney and Disney on Ice fan, I’m delighted to share this opportunity with my readers. 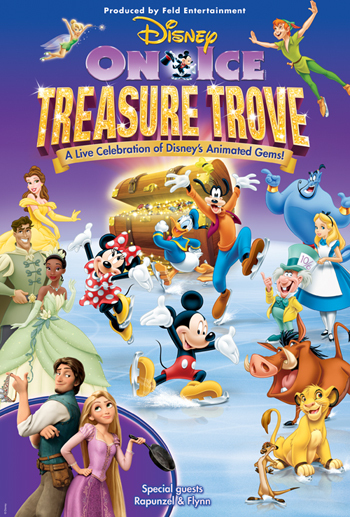 This entry was posted in Disney Movie Lines - Cinema Sunday, Disney on Ice, Giveaways and tagged Disney On Ice Treasure Trove, Free tickets to Disney on Ice. Bookmark the permalink. Totally a fan on Memory Maker as well…..
Have been a fan for a while! Looks like a good show! Although I love all the characters I have to say Timonand Pumba are my favorite! They are such a funny pair and very different and unlikely friends. Since my sons obsession began we have had to collect everything Lion King. We also have a collection of meercats books (yes they ate out there) and even Lion King tub toys. Nothing like the safari ride st AK to see the real thing although the four times we went on it wArthog never moved from his hole!!!! I am fan of Rapunzel as she is smart,witty and intelligent! I love Tiana, she made her dreams come true! Thanks for the chance! I am a facebook fan as Sarah Blake. We’d love to go and see Rapunzel! I love Snow White because she reminds me of watching the movie when I was a kid. My daughter and I love Rapunzel because she is smart and spunky! Would love to see the show 🙂 Thanks for the giveaway! I also liked your page on facebook! !